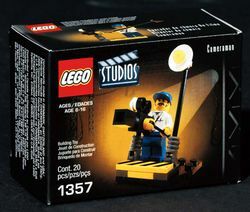 1357 Cameraman is a Studios set released in 2001. It includes a cameraman and a camera stand with a positionable camera and spotlight. It is part of a line of sets with Studio equipment and actors. This set was often included as part of a bigger set. This page was last edited on 3 May 2016, at 23:58.